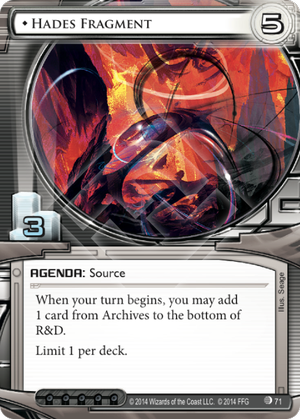 When your turn begins, you may add 1 card from Archives to the bottom of R&D. I wonder which is the strongest 5/3 agenda: Hades or Utopia Fragment. Utopia directly helps for the most important task of the Corp: scoring agendas. OTOH Hades is so versatile. It acts like a constant Jackson Howard which is arguably one of the strongest cards in the game. Hades can save agenda in the Archives. Hades recurs econ cards like Peak Efficiency which becomes stronger and stronger. There's also a combo with Executive Boot Camp if you have at least two copies of it in your deck. If the Runner runs to trash it, do it yourself and tutor the other copy, then recycle. When you're at match point, you can force the Runner to constantly runs on the remote if he fears that the unrezzed card is the final agenda. If your deck is running 5/3 agendas, then I think the current meta makes this an Auto-include for several reasons. First, it 100% cancels the runner's alternate win condition (see my post on the Noise: Hacker Extraordinaire page). Secondly, it works every single turn. With Anarchs having so many ways to trash cards, a steady flow of recursion (and the occasional R&D shuffle) will mitigate the loss of key cards and help keep other big agendas safe. Additionally, its ability is OPTIONAL. You don't have to use it. Lastly, not only does it protect you from the Runner's destructiveness, it also protects you from your own; cards like Accelerated Beta Test and Power Shutdown love Hades Fragment. The card seems to prefer being in Jinteki a little more than Weyland. Haas-Bioroid recursion actually benefits from having cards in archives, but bring back those recursion cards is really great. NBN is probably the worst fit as it tends to avoid big agendas like these and has Jackson Howard in faction anyways. Jinteki trap decks...yeah. Increasing the trap density in Archives, while putting Snare! back in R&D can get brutal. Weyland: did your first two Scorched Earth not land? No problem. Did you run out of Oversight AI? No problem. It's one of those cards where scoring it early put you WAY ahead. Pyjam has a really cool point regarding Executive Boot Camp. I suspect we'll see some interesting possibilities develop in the future with this card.